Last month during the webinar I did for TrekkSoft, I was asked for my thoughts on the most exciting trends in travel and tourism right now. My immediate response is something that both the industry and travellers can love, and it has to do with Instagram. Instagram has typically been slotted in to the inspiration phase of a traveller customer life cycle, what with its beautiful images and wanderlust-y captions, but recent changes to the platform have given it the opportunity to also fit into the planning phase. In case you missed it, after Instagram added the ability to save photos (and not be outed as being a total creeper), they also opened up the ability to create Collections and save photos to these Collections. What does this mean? Well, it's basically like bookmarking photos into folders. The traveller side of me is ridiculously excited because it's a way to organise all the photos I save when I'm researching [where to eat in] a destination. The tourism marketer side of me is also ridiculously excited because it's an opportunity for businesses who share valuable content on Instagram to get remembered for it. As a traveller, I tested out this feature for my last adventure and may have gotten a little overzealous. It makes it so. damn. easy. to keep track of all the amazing things you see on Instagram and then actually do / see / eat them. So, as tourism businesses, how you can you make this wicked new feature work for you? It's not as difficult as you may think. Here are five easy tips on how you can set yourselves up so that when travellers are using Instagram to plan their trip, they find and save your posts. At this point in time, there are plenty of aggregator accounts on Instagram, ones that almost only feature photos taken and posted by other people. These accounts have a dedicated hashtag, and anyone who uses that hashtag opens themselves up to be reposted. Even if you don't get reposted, using the hashtag is still a smart idea because in addition to checking out the aggregator account, users typically will also investigate the hashtag, knowing that there will be more posts of interest there. To keep things manageable, find three or four local aggregator accounts that are relevant to you. These can include your national, regional, or municipal DMO or CVB, as well as unofficial local food and activity accounts. 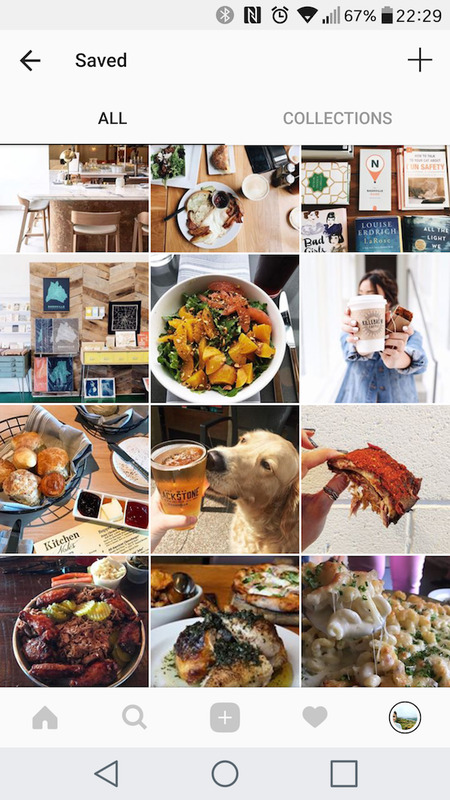 @infatuation is a popular food account (#EEEEEATS), with spin-off accounts in several cities. For my recent trip to Nashville, @nashville_eats (#nashvilleeats) was another go-to resource. In Toronto, @blogTO (#blogTO) is a catch-all for basically anything happening in the city. Source out similar accounts local to you, follow them, and use their hashtag when you post. Note the last few hashtags - they're the local ones. One of the most helpful pieces of information you can provide when you're posting a photo is to geo-tag it, meaning, add the location to the photo (you can do that by tapping Add Location just under the caption). Why is this so helpful? As a traveller, if I'm unfamiliar with a destination, I want an easy way to see where a photo was taken. It's a great way to help map out my travels, and also to know how this place relates to other places I'm planning on visiting. I can't underscore enough the importance of an informative caption. In addition to geo-tagging your photos, providing some quality info in the caption is incredibly helpful to travellers. For instance, is this restaurant only open for dinner? Does this viewpoint take an hour's hike uphill to reach? Why is this park better for picnics than the other one? The more information you offer, the more likely it is that someone will save your photo instead of someone else's, because in addition to a great photo and a geo-tag, you're also giving them helpful information they can use (rather than just a few emojis and a cliché). Sure, your Instagram account is primarily for promoting your business, but there's a lot to be said for sharing the love. Don't just post about your hotel / B&B / tour / activity / museum / restaurant / attraction / insert-your-business-here. It's not rocket science to figure out that if you're a tourism business, your customers are also interested in learning more about the place they're visiting. They want to know where to eat, where to drink, which streets to wander down, where to go for a morning run, which nature spots to chill in, how to get around, what events are happening in town, etc etc etc. Not only does this provide more valuable information (ahem, see point #3), but it also positions you as a local authority on the best things to see / do / eat / drink in your destination. Travellers also love to understand local context, something they're unlikely to get from traditional tourist resources. By providing this kind of information your credibility is heightened and you prove that visitors can count on you to give them authentic, real information when they're in town. It also shows that you're an active, supportive part of your community, something more people (ahem, Millennials) are happy to see. This is pretty obvious, and should be well-known by this point. Success on Instagram comes from posting eye-catching photos. They don't need to be professional, they just need to be good. In focus, well-framed, balanced colours, and not overly filtered or edited. Not sure what makes an eye-catching photo? Check out the aggregator feeds and see which photos are getting reposted. That should give you an idea of what the most popular types of photos are, and you can take some cues from there! The best part about all of these tips? You can put them all to use at the same time, in one pretty little post. A photo of the view from the hike to a nearby mountain peak lookout. Geo-tag the mountain, add the caption "It's one of the most beautiful hikes (we call them tramps) in the area - you need a car to get to the entry point, and then it's about four hours to the peak. It can get a bit chilly up there, so wear some layers, but remember that it's well worth the effort! ", and then use hashtags like @lakewanakanz's #lovewanaka, @purenewzealand's #NZmustdo, as well as other local ones like #gottalovenz, #wanderlustofnz, and #nzwalks. A photo of a wine tasting at a local winery. Geo-tag the winery, add the caption "Without a doubt one of the most beautiful wineries in NZ, with stunning views of Lake Wanaka and biodynamic wines, to boot! Pop in for a tasting and see how long you end up staying. ", and then use hashtags like #lovewanaka, #NZmustdo, #gottalovenz, as well as @nzwinegrowers' #nzwine. If you follow us on Instagram at @stormfreeagency, we'll be posting three more juicy examples posted there with the hashtag #makinginstatravelplanningworkforyou (it's not the longest hashtag we've ever come up with...promise). Any questions, leave a comment below or shoot us an email at hello@stormfreeagency.com.